If you ever wonder what might have been when it comes to cars from the factory; we just added two cars to our Feature Car pages that you will want to check out. 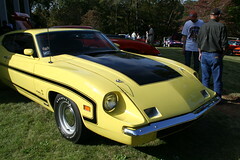 The first is the 1970 Ford King Cobra. It is a wild and fast 1970 Ford Torino prototype that was to be the top seat at NASCAR in 1970. The second is its Mercury counter part the 1970 Mercury Cyclone Spoiler II. These cars are owned by Steve Honnel of Tennessee and are driven and shown regularly. If you ever get the opportunity to see one or both of these cars make sure you do. They are outstanding and real pieces of history. Here is a quick video of the two but you will also want to check out the entire page and additional photos on our Feature Car page, Click Here. I think the man that owns the two cars (Steve Honnel) was the auto shop teacher at Jordan High School, Columbus GA, back in the early seventies. I remember he had an orange 70 Ranchero with a King Cobra front end and some from his class told me he had connections with Ford and Holman & Moody ( the company that built the Ford NASCAR race cars). If this is the same guy that use to teach in Columbus, GA.